Our Main Streets, mom and pops and storefronts are in many cases the first line of defense and first resource for when a storm hits. This summer, advocates from the Climate Action Business Association (CABA) are coming to Chelsea to equip small businesses with the tools necessary to be resilient and protected in the face of extreme weather. The Businesses Acting on Rising Seas (BARS) campaign, is an ongoing project that aims to inform community leaders and small businesses about the urgency of climate change and the need to incorporate climate resilient practices. 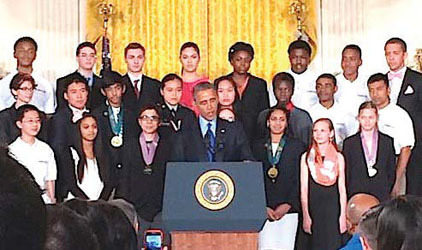 The BARS 2016 campaign reached over 500 businesses in Massachusetts, causing the campaign to gain national recognition and our Executive Director Michael Green to receive the White House Champions of Change Award for Climate Equity. This year, we have taken a more tailored approach by creating specific resilience guides for each one of our targeted communities, including city-specific information and resources. We have worked closely with the Chelsea Chamber of Commerce and the community-based organization, GreenRoots, based in Chelsea to create useful, informative, and low-cost steps that small businesses can take to improve their preparedness in the face of climate change. During the week of July 16, be sure to keep an eye out for CABA as we conduct our outreach campaign among the small business community in Chelsea or contact us before then to schedule an interview with us and become part of the BARS campaign. If you would like more information, contact Kristin Kelleher at kristin.kelleher@cabaus.org or call (617) 863 7665. The contract for the multi-year Mystic/Tobin Bridge Rehabilitation project will begin on April 1 for the first full year of construction on the upper and lower decks of the Bridge. The project is fully separate from the controversial Chelsea Viaduct project – which is adjacent to this project – and is still in the design phase. JF White received its notice to proceed last October and the contract begins on April 1, which will clear them to move in and begin work, particularly on the Lower Deck (outbound) part of the Bridge. The Lower Deck in each of the three-years will have one lane closed for concrete structure repairs. Another major component will be the temporary closures at different points during the year of the Everett Avenue on-ramp, the Beacon Street off-ramp and the Fourth Street off-ramp. On the first year, this year, that will be the right lane of traffic that will be closed outbound. On the second year, it will be the left lane, and on the third year, the middle lane. Paving and milling operations on the Upper Deck (inbound) is less intrusive and will only be done in off-peak hours with no lane closures expected. The ramp closures will likely be the most impactful thing for Chelsea residents this year, but McInerney said they will not close multiple ramps at the same time for construction. They will do one at a time. The first ramp up will be the Everett Avenue on-ramp, which is in deplorable shape. He said it will likely be closed from late April to May. Once that is done, they will move to close the Beacon Street off-ramp for two months. When it is completed, they will move to close the Fourth Street off-ramp for about one month. That is anticipated to happen in November. He added that the MBTA is working with them to talk about changes to bus routes that use those ramps. McInerney said there will also be extensive steel repairs on the Bridge, but the extent isn’t totally known right now. Once crews are able to set up access points, they will be able to examine the steel more closely. McInerney said before JF White proceeds on April 1, there will be a community meeting to address any concerns. Dates for those meetings are forthcoming. The project contract ends each Nov. 30 for the three-year period. 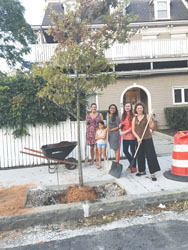 The new Chelsea Tree Board celebrated Arbor Day last month on Clark Avenue by planting a White Oak in recognition of Member Denise Ortega’s birthday. Chair Julie Shannon said the Tree Board hopes to promote the value of trees in the community and the benefits for health and wellness. The Board, along with Assistant Public Works Director Fidel Maltez celebrated the day with a commendation. On June 8 2016, One North of Boston, a luxury apartment complex in Chelsea, MA, invited members of their community and team to witness the unveiling of their completed gymnasium, dedicated to the memory of Francis Cronin. One North is managed by Redgate Real Estate Advisors and is owned in a Joint Venture between TransDel Corporation and Gate Residential Properties. and Redgate Principal Kyle Warwick. Kyle Warwick, Principal of Gate Residential, proceeded to lead a tour throughout the property, noting memorable designs and milestones that Cronin had accomplished during the development of One North. A former Harvard graduate and beloved athlete, Cronin was a superintendent at Callahan Construction Managers, working with Gate Residential and TransDel Corp., to accomplish the design and construction of the complex. In attendance, was Cronin’s wife Judy Smith Cronin along with their daughters Hannah, Mariah and Kim whom received $10,000 from the One North team to put towards college tuition. Members of Redgate Real Estate Advisors, Callahan Construction, and the One North Boston Team presented a plaque in his honor, placed on the entrance of the gymnasium. Apart from the dedication of the gymnasium, there will also be a scholarship in Cronin’s name that can be donated to through the Dartmouth High School Guidance Department. The Roca, Inc. High-Risk Young Mothers Program is honored to be a recipient of the Center for the Study of Social Policy’s inaugural Accelerating Change Award. The award recognizes programs and initiatives that have demonstrated a commitment to reach diverse populations of young women and girls of color and create opportunities for their well being and success. Young women and girls of color—especially those involved in or at risk of involvement in public systems like child welfare and juvenile justice—face a unique and alarming trajectory that puts them at risk of poor outcomes in life. To spotlight organizations, programs and practices that interrupt that trajectory, the Center for the Study of Social Policy (CSSP) is recognizing initiatives such as Roca’s High-Risk Young Mother’s Program for our compelling and creative interventions to make a difference in young women and girls’ everyday lives. Roca and four other organizations were selected after a nationwide competition. Along with national recognition, a small honorarium to support our work and an opportunity to join a network of similar high-performing initiatives, members of Roca’s High-Risk Young Mother’s Program will attend United State of Women Summit hosted by the White House next month. The United State of Women Summit will rally women and girls across the nation and abroad to discuss key gender equality issues, such as economic empowerment, educational opportunity, health and wellness, violence against women, entrepreneurship and innovation and leadership and civic engagement. Tiffany Green, 23, 124 Washington Ave., Chelsea, was arrested for shoplifting. Anthony Ferullo, 26, 14 Union Ave., Everett, was arrested for shoplifting. Sergio Amado, 26, 124 Bow St., Everett, was arrested for operating a motor vehicle unlicensed and for shoplifting. Mary Sackor, 29, 25 Staniford St., Boston, was arrested on warrant and possessing Class B drug. Justin West, 43, Kasneck House, Malden, was arrested for possessing Class B drug. Steven Carter, 48, 7 Brinsley St., Dorchester, was arrested for assault and battery, assault with a dangerous weapon, attempted murder, assault and malicious destruction of property. Bianca Gell, 18, 104 Lindon St., Everett, was arrested for receiving stolen motor vehicle, receiving stolen credit card, furnishing false and withholding evidence from criminal proceeding, breaking and entering nighttime vehicle/boat for felony. Juvenile Offender, 16, Everett, was arrested for receiving stolen motor vehicle, possessing heroin. Brian Belew, 30, 179 Franklin Ave., Chelsea, was arrested for conspiracy to violate drug law, trespassing and possessing heroin. Rose Sheehy, 34, 828 Salem St., Malden, was arrested for sexual conduct for a fee. Sidney Pierre, 28, 16 Reynolds Ave., Chelsea, was arrested for possessing to distribute Class A drug, conspiracy to violate drug law. Pamela Blankinship, 46, 625 Main St., Reading, MA was arrested for forge/misuse RMV document, conspiracy to violate drug law. Bladimir Aracia-Lopez, 31, 691 Saratoga St., East Boston, was arrested for disorderly conduct. Peter White, 46, 40 Powder House Rd., ext., Medford, was arrested for shoplifting, furnishing false name and on a warrant. Phillip Ruiz, 43, 120 Central Ave., Chelsea, was arrested for assault and battery with a dangerous weapon. Isidoro Cruz, 46, 27 Columbia Rd., Dorchester, was arrested for assault with a dangerous weapon. Miguel Rodriguez, 23, 155 Chestnut St., Chelsea, was arrested for probation warrant. Lynne Walsh, 54, 132 Washington Ave., Chelsea, was arrested for assault and battery with a dangerous weapon (2 counts) and on a warrant. Christina Dorsi, 29, 48 Suffolk ST., Medford, was arrested for shoplifting. Okbay Bahatu, 31, 318 Chestnut St., Chelsea, was arrested on a warrant. Melvin Maldonado, 29, 25 Whittier St., Boston, was arrested on a warrant. Nathan Andrews, 31, 46 Tudor St., Chelsea, was arrested on a warrant. Abele McCabe, 30, 423 Eastern Ave., Chelsea, was arrested on a warrant. Omar Baires, 36, 57 Grove ST., Chelsea, was arrested for affray. Nain Montiel, 46, 87 Garland St., Everett, was arrested for affray. Philip Hebert, 38, 2022 General Delivery, Boston, was arrested on a warrant. Juvenile Offender, 27, was arrested on warrants. Edward Perez, 25, 501 Washington St., Lynn, was arrested for disorderly conduct and resisting arrest. Kelley McDougall, 29, 58 Newcomb Rd., Stoneham, was arrested for operating motor vehicle with suspended/revoked license and reckless operation of motor vehicle. Guillermo Duran, 41, 11 John ST., Chelsea, was arrested for possessing Class B drug, conspiracy to violate drug law. Miguel Figueroa, 22, 116 Hawthorne St., Chelsea, was arrested for distribution of Class B drug, possessing Class B drug, possessing ammunition without FID card, conspiracy to violate drug law, possessing to distribute Class B drug and drug violation near school/park. Claudio Flores, 42, 83 Chester Ave., Chelsea, was arrested for operation of motor vehicle unlicensed. Wayne Clark, 58, 10 Magnolia St., Dorchester, was arrested for possessing to distribute Class A drug, possessing to distribute Class B drug, possessing to distribute Class B drug, drug violation near school/park. Jocelyn Valentin, 29, 23 Eleanor St., Chelsea, was arrested on probation warrant.